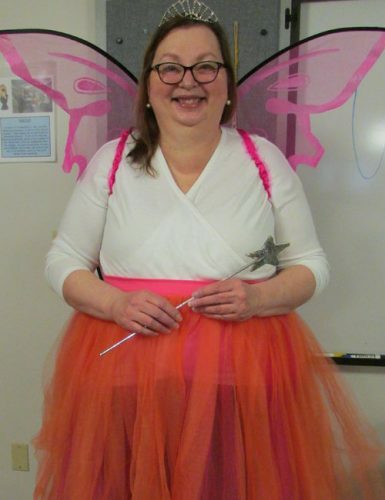 Julie Frew dressed up as the Book Fairy for an adventurous fairytale-themed Story Time at Milford Public Library. MILFORD — The Milford Public Library will hold “The Garbage Monster” program at 6:30 p.m. Monday, April 22, in the meeting room. Suzanne Stokes, the education outreach coordinator for Kosciusko County Solid Waste Management, will introduce kids to her friend named Garby — a trash can filled to the brim with items that aren’t all trash. She will read a book by Joni Sense. Kids will learn how Joni tames her garbage monster and talk about how everyone can tame their own at home by learning about recyclable materials. Children then help sort through Garby to determine what items are recyclable and what you can do to make less trash. Join the library for this free program. Milford Public Library has been in the same building for 100 years. A date has been set for the celebration of the library’s 100th anniversary. On June 28, a variety of activities will take place at the library and the library staff will be dressed in costumes of that time. Look in local papers or the library newsletter for the upcoming series of articles detailing how the Milford Public Library became a Carnegie library. Join the library for Story Time at 10:15 a.m. or 1:30 p.m. Wednesday, April 24, or at 7 p.m. Thursday, April 25. The Story Time theme for the week is “Spring Chickens.” Miss Julie and Miss Tiffany will read several books about chickens and eggs such as “Big Egg” by Molly Coxe and P. Zonka Lays an Egg” by Julie Paschkis. The kids will make a handprint chicken for the craft and share a delicious chick pretzel snack. If you would like to attend Story Time, sign up at the children’s circulation desk or call (574) 658-4312. Thrilling new titles for adult and teen fiction include “Someone Knows” by Lisa Scottoline, “My Lovely Wife” by Samantha Downing, “The Voice Inside” by Brian Freeman, “Everlasting Rose” by Dhonielle Clayton, and “Heroine” by Mindy McGinnis. Anyone who enjoys large print fiction will love to see that the library is getting new books for that collection. This includes “The 18th Abduction” by James Patterson, “Redemption” by David Baldacci, “The Girls at 17 Swann Street” by Yara Zgheib, and “Killing Trail” by Margaret Mizushima. If you are interested in placing a hold or checking out any of these items, please call the library at (574) 658-4312.